If the right people were medicated, we wouldn't have to be. Do It At Home, America! Exclusive Interview with Murray Hill, Inc. Profile in Courage: Kid Corp.
17 Obama: Too Chill for the Spill? 18 You’re Soaking in It! 25 Don’t Be a Sucker! Republicans give themselves more reasons to exercise their God-given spin control muscles than Democrats do. Sure, Dems like Anthony Weiner have to tuck their Twitter accounts back in their pants now and then, and some sucker with industrial strength pliers has to shadow Joe Biden and dislodge that foot from his mouth every few days. But only the GOP has to own up to endless, egregious affronts on consensus reality — like Jan Brewer’s headless bodies in the desert, Bobby Jindal’s “Bible Math” and any noise that comes out of Michele Bachmann’s mouth when she opens it. The Republicans have exercised so many spin control muscles that those muscles have started to act involuntarily and instantaneously. Like the heart at the core of any wild animal, the GOP has developed an instant if not repetitive spin for everything. Got no experience? You’re the Washington outsider we need! Can’t locate Iraq on a map? Well then, you’re just like a regular American! Sometimes, conservatives are so proud of how they’ve spun their embarrassments that they refuse let them go. One of those embarrassments made two comebacks this year. 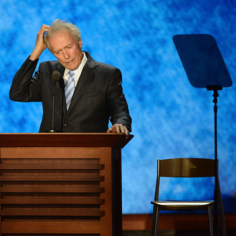 We’re talking Clint Eastwood’s Empty Chair! You know, that chair. The one Clint bizarrely dragged onstage at the 2012 GOP convention and had a long, painfully awkward one-way conversation with. Even Republicans were against this senile display before they were for it. Inevitably, the chair’s first comeback was in January when it found a home in the office of RNC Chairman Reince Priebus. Talk about “owning” the party’s missteps! And this week, everybody’s favorite turtle impersonator, filibuster enthusiast and all around funnyman, Mitch McConnell, gave the spun-out meme a new spin. So it was pretty bold of Mitch – in his public response to Obama’s comical jab at the White House Correspondents’ Dinner that ended with, “Really? Why don’t you get a drink with Mitch McConnell?” – to pose next to an empty chair reserved for Obama in a Twitter photo. This got our brains a-whirl. 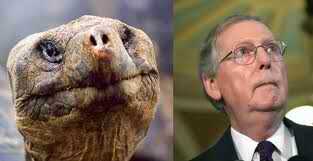 If the Obama chair can make two comebacks, what’s next in the GOP garbage heap for them to recycle and rebrand? What do you think? What’s the next political disaster they’ll turn into a triumph? Want to find out what people wrote in? Subscribe to the Lester & Charlie Newsletter! NEW Video From Lester & Charlie’s “Do It At Home, America!” Series: Make Your Penny Candy! Have a private comment that you wouldn’t mind seeing broadcast to an international audience in the next Lester & Charlie Newsletter? Leave it here! « Make Your Own Penny Candy!